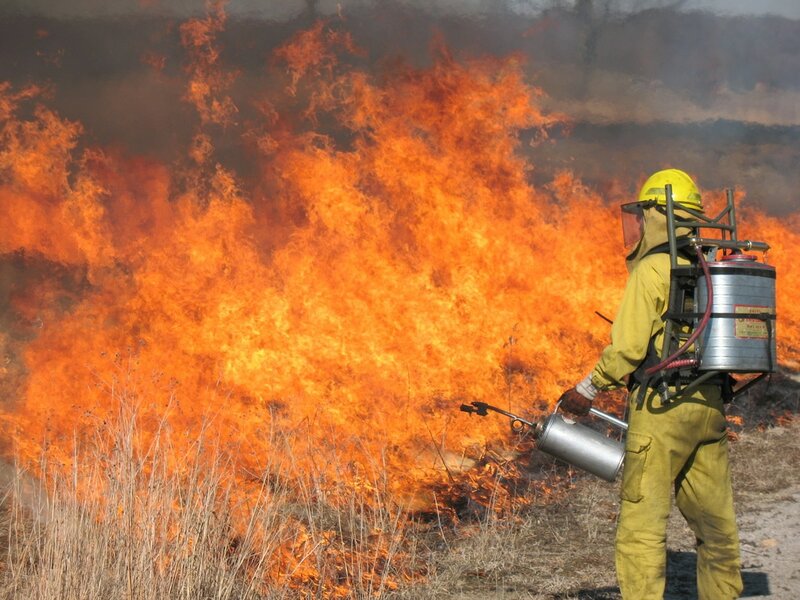 Most of the grass and brush fires that are intentionally started in Michigan occur in spring. Often referred to as “prescribed burns” (done according to some type of plan), they range from large-scale projects by government agencies to ditch-bank burns along farm fields. In some areas of mid-Michigan, the night sky on a calm spring night may reflect the glow of dozens of miles of fence rows or ditches set afire. Lots of scientific studies have demonstrated that fire is often the most economical tool for eliminating undesirable vegetation, promoting prairie grass, and reducing the risk of wild fire. Nevertheless, deciding whether to burn remains a complicated—and controversial— issue in land management whether it’s done on public forests or small pieces of private property. Prescribed burning is frequently used in the southeastern U.S., especially for management of quail habitat and pine plantations. It is so important in Florida that, in 1990, parties often on “different sides of the fence”—preservationists, ranchers, wildlife and forest agencies, timber companies, and others—worked together to pass a landmark Prescribed Burning Act. It outlines acceptable forestry burn practices and protects responsible prescribed burners from civil liability as long as they are not found negligent. Fire has also been used in the West to maintain prairies, but use of burns in the Midwest is very limited. Historically, land managers in Michigan have held back on the use of fire, citing a host of concerns. These include scheduling difficulties owing to Michigan’s climate and often unpredictable weather, possible air pollution from smoke, and potential safety, liability, and public relations problems. Such concerns were reinforced by a tragic burn in 1980 in the Mio area of the northern Lower Peninsula. Designed to create habitat for the endangered Kirtland’s warbler on jack pine plains, the fire, set during high winds, escaped onto private lands and ultimately led to the death of a fire fighter. Some attempts have been made to bring the message of burning’s values to the Michigan public. In 1993, the U.S. Forest Service and the Michigan Wildlife Conservancy launched the Fire Up For Wildlife project, jointly promoting and funding burns aimed at restoring and maintaining grasslands and other cover types in Michigan’s Huron-Manistee National Forest. The Michigan Nature Association has conducted prescribed burns on many of the lands it manages for protection of rare plants. And in 2002, some natural resources managers started what was eventually named the Michigan Prescribed Fire Council (MPFC) in response to legislative threats to prohibit many types of prescribed burning. The MPFC is still around, and recently hosted its 3rd Annual Burning Issues Workshop. But more needs to be done. Better information about the benefits of burning needs to get to landowners, non-profit organizations, local fire departments and other people. Long-standing administrative taboos against burning need to be re-examined in light of hard data. Otherwise, Michigan’s wildlife lose.